Bharath Samrat has long been dreaming about reaching the summit of Kilimanjaro. He is now ready to take on the challenge as he prepares to summit Africa’s tallest peak and one the Seven Summits. Bharath and his Berg Adventures team will traverse the mountain VIA the Umbwe Route. They will trek through the plains of Tanzania, to the rainforests and dry alpine desserts and up to the glacial arctic conditions at the top of the mountain where Bharath will have a chance to sleep in the Crater of Kilimanjaro as well as stand on the very highest point in Africa, Uhuru (“Freedom’) Point, at 19,340 feet, 5895 meters above sea level. After Bharath makes his attempt on the mountain he will travel to Ngorongo and Tarengire. He and the Berg Adventures Safari guides will be on the lookout for the diverse wildlife and natural beauty this great country has to offer on his 3 day wildlife safari adventure. We invite you to join Bharath on this incredible journey as we document his climb and safari through daily dispatches. February 20, 2014 – Celebration Time! February 17, 2014 – Bharat Has Reached High Camp Below the Crater Rim! 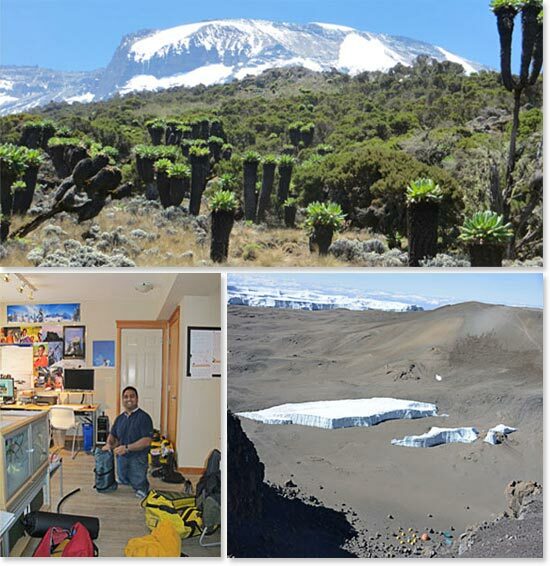 February 13, 2014 – From Umbwe Cave Camp to Barranco We Go! February 12, 2014 – Bharath Wakes Up to a Big Surprise! February 10, 2014 – Bharath Has Arrived in Tanzania!